The Cleveland Browns entered Sunday’s game against Indianapolis knowing that one more loss and their dreams of making the playoffs this season were down. Head coach Mike Pettine and the team went into the biggest game of the year backing quarterback Brian Hoyer, who was coming off a five-game stretch during November that featured some of the poorest quarterback play seen in these parts in a while – and that’s saying something. On Sunday, the team had Hoyer’s back (except for running backs Isaiah Crowell and Terrance West, who averaged just 3.7 yards per carry against a Colts defense that came into the game giving up 4.5 per carry. Oh, and kicker Billy Cundiff; definitely Cundiff.) But Hoyer couldn’t reward the faith that his coach and his teammates had shown in him. And because of that, the season is pretty much over for the Browns. Hoyer finished the game – and quite possibly his time as the starting quarterback for the Browns – with just 14 completions in 31 attempts for 140 yards and two more interceptions. Hoyer never looked comfortable against the Colts, with the exception of a touchdown drive at the end of the first half, as he continued to miss throws and twice overthrew receivers on what would have been sure touchdowns. The continued poor play from Hoyer was made even more disappointing because the defense turned in one of the best performances from a Browns defense in a long time. 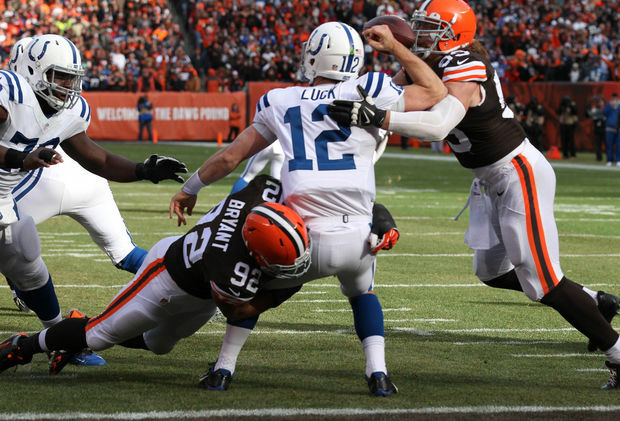 The Browns harassed Colts quarterback Andrew Luck all game long, sacking him three times – one that resulted in a defensive touchdown – and intercepting him twice – one of which was returned for a touchdown by cornerback Justin Gilbert. And a week after holding Buffalo to just two-of-15 on third down, the Browns limited the Colts to five-of-16 on third down as the defense was making things happen all over the field. The only way the defense could have played better is if they had kept the Colts out of the end zone at the end of the game. 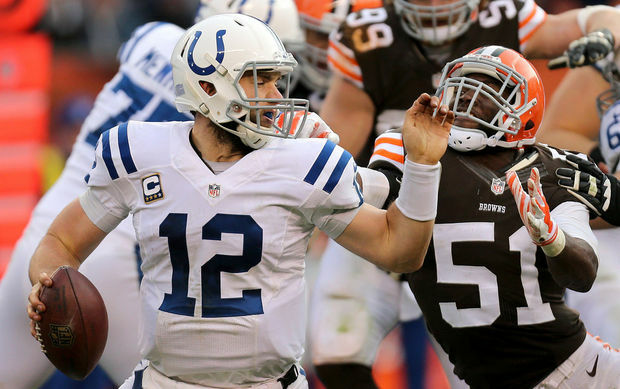 But Luck drove the Colts 90 yards in 11 plays – helped by a more-than-questionable pass interference penalty on Buster Skrine – and finally broke what was left of Cleveland’s heart with a touchdown pass to T.Y. Hilton with 32 seconds left in the game. Of course, that touchdown would have only been a potential game-tying score if Cundiff hadn’t missed a 40-yard field goal in the second quarter. The miss marked the fifth consecutive game that Cundiff has missed a kick, but there apparently is only so much blame to go around and it all has to fall on Hoyer. With the Bengals being embarrassed on Sunday, the Browns missed a huge opportunity to stay tied with Pittsburgh and Baltimore and sit just a half-game out of first place in the AFC North. And with their next two games coming against Cincinnati and Carolina, it is conceivable that the Browns could still get to 9-6 as they head into the season finale in Baltimore. But it’s hard to see them doing that with Hoyer. Hoyer has now thrown 10 interceptions against just three touchdowns since the calendar turned to November. The Browns also have just one touchdown in their last 29 offensive series with Hoyer at quarterback. 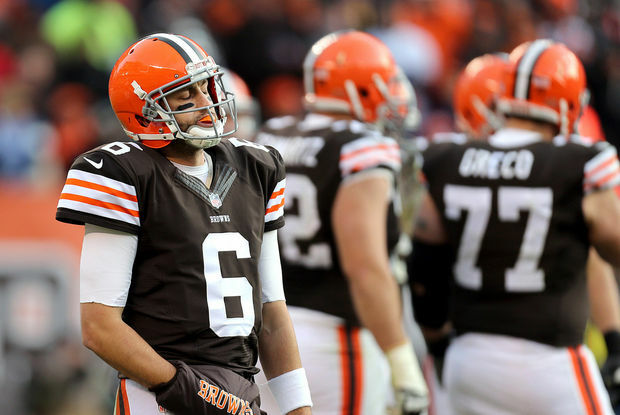 Hoyer is also zero-for-nine with a pair of interceptions in the red zone over the past three games. Whether it is because he’s hurt, or he’s lost his confidence, or he’s just hit his ceiling as a quarterback, something is definitely wrong with Hoyer. And the Browns are paying the price. While we understand Pettine’s decision to start Hoyer this week, it’s hard to see how he can bring Hoyer back out as the starter against Cincinnati. There is simply nothing from Hoyer’s play over the past six games to warrant anyone thinking he can turn it around over the final three games of the season. Even if Johnny Manziel only knows 10 percent of the offensive playbook, it’s hard to imagine him playing any worse than Hoyer has over his past 24 quarters of play. And even if the playoffs are now just a distant dream, Pettine needs to do everything he can to make sure the Browns don’t close out the season in disappointing fashion. As fun and exciting as this year has been, make no mistake about it: the Browns can’t go from 7-4 to 7-9 and feel good about what they’ve accomplished this season. After Hoyer’s performance against the Colts, the Browns have nothing left to lose. It’s now up to Pettine to decide if he wants to take advantage of that freedom and make a change at the quarterback position.